Umcka ColdCare Alcohol Free Liquid / 1 oz - Nature's Way®. Pelargonium sidoides 1X – the main ingredient in Umcka ColdCare – works with the immune system to help support the body’s own defense mechanisms. That means you’re getting a medicine that works safely with your body – not against it. Why Umcka ColdCare 99.9% Alcohol-Free Drops? 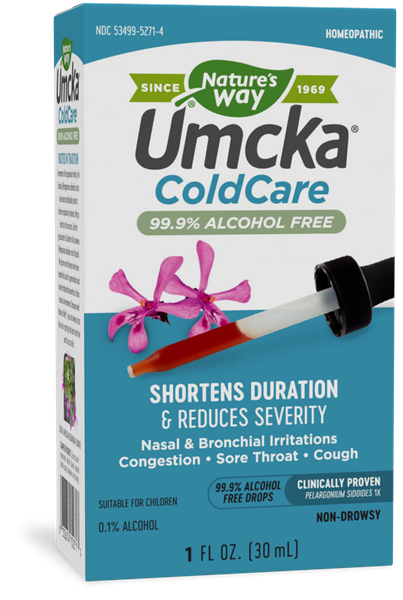 Umcka ColdCare 99.9% Alcohol-Free Drops come in a concentrated liquid form with droppers for convenient dosage. You can take it straight or add it to a beverage – whatever is more convenient for you. This 99.9% alcohol-free formula is safe for ages 6 and up. Umcka ColdCare Drops are also available in an original formula. Adults and children 12 years of age and older: Take 1.5 mL three times daily by mouth. Children 6-11 years of age: Take 1 mL three times daily by mouth. Stop use and ask a doctor if new symptoms occur, symptoms get worse or do not get better within 7 days; fever worsens or lasts more than 3 days; cough lasts more than 7 days or occurs with rash or persistent headache. These could be signs of a serious condition.